Bravo on the understanding of the importance of the historicity of Jesus and especially His resurrection. Too many approach Christianity as a mere world view or equate it with the teachings of other world religions based on a practiced or accepted dogma. I wrote a fb note a couple of years ago on the most prolific writer in the NT — which to my surprise is Luke and not Paul. Paul was a very close second and extremely close if you included Hebrews. Luke tops the list based upon the number of Greek words included in the New Testament canon (btw the structure of the canon itself makes a powerful yet subtle statement that Paul did NOT write Hebrews — ask if you’re curious). The ramification that Luke, who claims historical personal research, is the most prolific writer supports the concept that Christianity is primarily historical and only didactic in a secondary and supportive manner. Oddly enough it is Paul — the champion of the “teachings” of Christianity — who stated that if Christ is not in fact, historically raised from the dead, our belief structure is void. 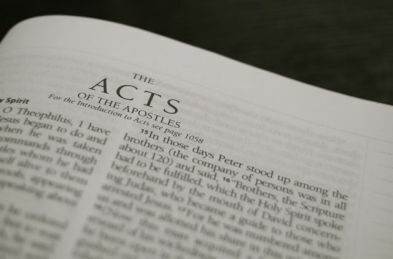 Significant to this discussion also is the literary structure of the Book of Acts. Luke uses a literary method known as Preparation/Realization as part of the the arrangement of the content. The table of contents, if you will, was given in Acts 1:8 and the remainder of the Book is an expansion and realization of that outline. When you notice that the movement of the Book is from local to global in its geographic scope, you readily see the significance of the catalog of 15 people groups in Acts chapter 2.